Looking over previous articles in this series, including that by Maurice Moss (39:305–306), I was intrigued to see that I have listed books with a completely different slant on microscopy. For instance Maurice described, with the obvious enthusiasm that he always displays towards his subject, a series of books, which cover many of the objects that we can study using the microscope. My list is completely different in that it is skewed towards technique and historical – my main interests are in the design and use of the microscope and its history – rather than the collecting of specimens and slide-making. I think this dichotomy between our different interests highlights one of the excellent facets of the Quekett built in by the original founders – that it should be an organisation to bring together people of like mind but differing ranges of interest and expertise in the subject of microscopy. It is pleasing to see that this is still the same today as it has been for the past 143 years. 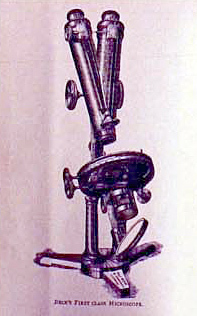 My background is in the ophthalmic manufacturing industry, and the optical training I received, together with an interest in the Victorian period [I have a collection of instruments dating from the mid 1800s to the current day and also a collection of Victorian slides – of varying quality], have produced an interest in the technology of the microscope. I find that the level of expertise and manufacturing skills obtained by the Victorians to be absolutely amazing – no computers to carry out the calculations in the 1800s and CNC machines were a hundred years away! That many of the microscopes produced during that period are still in full working condition today is remarkable. How many of the modern equivalents will still be working in 2108? The same applies to the many Victorian slides that can still be found today: many are well over 100 years old and are in a remarkable state of preservation, and well worth collecting. Every time I look at one the slides in my collection, I seem to find something new to study, and it is particularly pleasing to be able to do so when using an instrument of the same period. I like to think that I am carrying out the same tasks in the way that a Victorian microscopist would have done on the same instrument so many years ago. It is quite a humbling thought. These facts and thoughts colour my comments and reasons for the interest in the particular books I have chosen. I should also mention that they are listed alphabetically, by author, rather than by relative degree of interest. 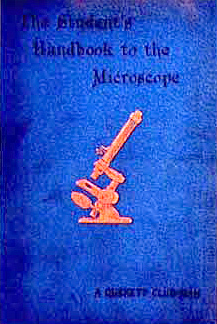 Barron’s book on using the microscope  was published in 1965 as a revision of Olliver’s earlier manual , and may be slightly out-of-date from the technique point of view. It is written in an easy-to-read style and sets out to explain some parts of the subject that other books gloss over. This aspect is particularly well illustrated in a chapter entitled ‘Selecting the right equipment’. Here the author emphasises some obvious, but often overlooked, factors that are vital in selecting an instrument – either new or second-hand. Arthur takes 26 pages to set out the various poinrs to consider in much detail, something that most other books gloss over. The chapter is divided into two sections, covering new and second-hand instruments and includes thoughts on suggestions for novices and even ‘how many microscopes’. In the section on second-hand instruments he is very forthright, saying: It is a great mistake to buy a second-hand instrument because it is cheap, or because it has elaborate and impressive fittings and a great number of accessories. The stand may be wortbless and the greater part of the accessories either obsolete or useless. That puts me firmly in my place, as I have collected several of my instruments mainly because they had a large set of accessories, or were of an interesting or complicated design. In particular, perhaps I should have heeded Arthur’s advice against purchasing Wenham binocular stands: … the beginner would be well advised to shun these instruments …, as he felt that the quality of production varied enormously, and that the prisms were easily damaged due to their fragile nature. However he went on to say: On the other hand if a good example can be found, it will yield very gratifying low-power stereoscopic images; but it should be looked upon more in the nature of a luxury than as an everyday working microscope. At least that relieves my mind somewhat; I can go on enjoying my Wenhams with a relatively easy conscience. His contents are divided into two main sections: one – The Microscope, and two – Photomicrography, a particular interest of Arthur’s. Although this section is set firmly in the days of film, it does offer a lot of good advice on types of apparatus, projecting a real image, depth of focus and much more. It also has a chapter on colour filters and illumination, still relevant today. Apart from all the useful advice and information, the book also has a personal interest, as I knew Arthur for many years – well before I ever became fully interested in the microscope, or indeed the Quekett so when I saw the book listed in a catalogue, it was a must. Next on the list is Richard Beck’s book . Unfortunately my copy is not the 1865 original, but the facsimile edition of 1987 – but just as interesting nonetheless. This is particularly so for me, as my interest in things Victorian has led to the inclusion of some Beck instruments in my collection and this was an obvious book to purchase. It fully describes the range of Beck microscopes available at the time and is, therefore, a valuable source of information for determining what that “odd piece of apparatus” was used for (and still is wherever possible). For instance, Beck produced a number of ’selenite’ plates and slides, and I have found the description of these useful in determining how each is used. 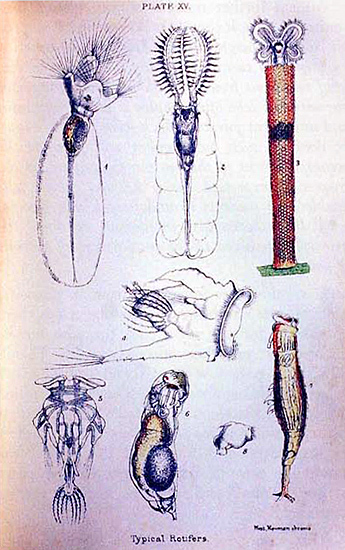 The text includes descriptions of the various stands produced by Beck at that time, First and Second class stands, Third and Fourth-class microscopes and Single Microscopes – hand magnifiers, Darwin’s Dissecting Microscope and Apparatus and Improved ditto, with Binocular arrangement. Until I read this section, I hadn’t realised that Beck had produced a very simple instrument to the express design of Mr Darwin, and it is with such arrangements that he has carried on many of his valuable investigations. Having re-read the text describing the binocular version, I am not sure how easy it would have been to use, or what results may have been expected. One eye had to view the image directly, whilst the other saw the same image via a combination of two right angle prisms. This resulted, apparently, in two unequal fields of view, with the area included in a small circle being the only area that was stereoscopic. But the writer goes on to say that the result was no worse than the disadvantages of smallness of field common to all binocular single microscopes of moderate power. Apart from the detailed descriptions of the various stands, Beck describes the many accessories produced by the firm and has one chapter devoted to Polarized light, as applied to the Microscope, a subject dear to my heart. In this he covers Nicol’s prisms; the selenite plate; Darker’s retarding plates of selenite; Darker’s selenite stage; tourmalines; polarizers for large objects; experiments with double-image prisms and crystals to show rings. The eleven pages of this section give a very good idea of the use of polarization with the Victorian microscope. The very detailed text also helps in understanding some of the reasoning behind the designs of the time. One particular description, covering the use of the Lieberkuhn, discusses the effects of the direction of illumination on A splinter of Lucifer Match, bringing to light (excuse the pun) the use of this accessory to obtain oblique illumination from above – stating To exhibit the object, Lieberkuhn illumination is much the best, and with it there is no difficulty in showing, by one adjustment of the light, the longitudinal woody tissue, the transverse medullary rays, and the beautiful coniferous glands of a Lucifer. Quite a poetic description of what is really a very ordinary specimen. Although it is interesting to study the historical aspectS of the hobby it is also necessary to have some more up-to-date literature, and Bradbury & Bracegirdle  fits into the category. It is an excellent handbook for both the beginner and more experienced microscopist. Although I am an optician by profession, with many years in the industry, I knew very little about the use of the microscope in practical terms when I regained my interest. This was the first book I purchased to remedy the situation and chapters such as “Dissatisfaction with the microscope image”, have been particularly useful in pointing me in the right direction. The book starts with the questions “why use a microscope?” and “what is a microscope?” and follows these with a general introduction to some basic optics and then the main lens aberrations – chromatic aberration, spherical aberration, coma, astigmatism, field curvature and distortion. Each of these is well covered in reasonably simple-to-understand terms. The authors then take us through the various types of ‘microscopes’ – the hand lens, low-power stereomicroscopes and compound instruments. After two sections dealing with basic concepts of objectives and eyepieces and illumination of the specimen, the book concludes with an excellent series of chapters dealing with the ‘practical use of the microscope’. All in all a very useful book. The next book in my list is by Bradbury & Evennett : this carries the discussion of contrast technique further but in a more advanced and specialised manner. Again, this has been very useful in correcting some of my many errors. Although the contents go into optical theory quite deeply, the text is written in an easy to understand manner and makes the learning process relatively painless. Starting with fundamental considerations covering light and the specimen, absorption, transmission and reflection, it then goes on to deal with scattering and diffraction, polarized light, phase change and fluorescence – thus covering virtually all that the microscopist needs to know about lighting the specimen. I particularly like the chapter on phase contrast, covering as it does the various developers of the technique, such as Fritz Zernike and Köhler and Loos of Zeiss, who made the technique commercially available. The authors point out that the use of phase contrast allows the enhancement of contrast in suitable specimens, without appreciable loss of resolution, proving extremely valuable for study of living cells. Another subject dealt with in depth is the refractive difference between specimen and mountant and how this can be exploited to determine the refractive index of the specimen by means of the Becke line (a bright line that surrounds the edge specimen when the focal plane is altered). I well remember the excellent workshop run by our President Pam Hamer covering some forensic techniques, and one of these was the use of the Becke line to determine the refractive index of a glass specimen recovered from a supposed “crime scene”. After an explanation of the technique by Pam, we were set to carry out the experiment ourselves – unfortunately I didn’t get anywhere near the index – particularly galling in view of my optical background! Also covered in the book are interference contrast, fluorescence microscopy and polarized light techniques. For anyone with a serious interest in learning about illuminating techniques or improving their skills when using the microscope, this book can be well recommended. My interest in Victorian slides meant that Brian Bracegirdle’s book on mounters  just had to be added to my library. Although the photographs are not really, of necessity, detailed enough to help in studying the specimen, they are an immense help in tracing the probable mounter for those slides where the label is not always as helpful as it might be. I find that part of the interest in owning these old slides, is in the study of the mounters themselves. A book such as this is invaluable for such a purpose. Brian photographed nearly a thousand slides at almost full size and in colour for the book, and the range includes commercially-prepared items and those from amateur mounters: also included are a number where the label has been added by the collector rather than the mounter. All comments are supported by documentary evidence or the evidence supplied by the label or specimen itself. Particular thanks are given in the preface to Brian Davidson who supported the task of producing the book by providing many of the specimens from his own collection. The book is arranged alphabetically by mounter, and also includes the major suppliers of mounts and I find the interspersed sections that cover such diverse specific subjects, such as algae, arranged diatom mounts, bacteria and so on, interesting. These added sections often go into quite a lot of detail and are very informative. For any collector, or for those who just have an interest in the history and production of slides in the Victorian period and into the 20th century, this is a very valuable book, containing, as it does, a large amount of detailed information. Of course another book I had to acquire is his companion book on post-1850 microscope makers , and this has also proved extremely useful. It has helped me date many of my microscopes – some only approximately, but without the book, I would not have known where to start. As with the previous book, this one is also very informative and often includes reasonably detailed lists of serial numbers – invaluable for dating instruments in a collection. In the preface Brian has pointed out that much dating of microscopes in the literature is misleading and inaccurate, as the dates given are only estimates. In his book all the dates and serial numbers quoted have been checked against existing documents and catalogues, thus making the book a reliable and accurate source of information. As with the previous work, this one is also divided alphabetically and covers all the known manufacturers of microscopes from approximately 1850 to the mid twentieth century – thought by many to be the ‘golden age’ of microscope manufacturing. Apart from the individual entries, there is an extensive bibliography covering historical background, the history of scientific instrument manufacture and a list of catalogues of important collections. This section concludes with pointers to existing collections held by museums, which can often be viewed by the serious enquirer – thus providing an important method of study. This is probably not a book for non-collectors, but for those who do have the collecting bug (such as myself), it is another invaluable source of information and allows the general dating of a instruments, something that I think adds to the interest in such a collection. I find the various details regarding the Victorian manufacturers of great interest; they often help one to view the design of the instrument in the context of the period. It is this study of the manufacturing techniques used in the mid to late 19th century that I find so interesting – it adds greatly to the collecting. I now come to a book, which does cover both the microscope and what you can see when using it. This has an extremely long title, but is just referred to as Carpenter . The length of the title matches the size of the book – a ‘light read’ it is not. At over 1000 pages this is the longest book in my selection and although I have had it for a number of years now, I am still finding something new every time I pick it up. Found for me by a friend, in a charity shop, it has seen better days – a few pages are missing (but at over a thousand who’s counting?) and several have lengthy annotations by a previous owner, and it has been re-bound by an amateur. But perhaps that’s why it was in such a shop. Anyway, I find it a fascinating book. It is a little difficult to discuss what exactly this book contains, as there is no contents list (quite possibly this was in the missing pages), but this is more than made up for by a lengthy index, which runs to some forty-four pages. There are also a number of appendices and tables ‘useful to the microscopist’. One of these lists useful data(?) for Norbert’s last 20 band test plate, which shows that the number of lines per inch for the 20 band was 225,190.3 – and that the difference between each band was 11,259.5 – some very precise figures! Some other ‘interesting’ pieces of data listed in one of the tables (Useful numbers and formulae), show that the “Paris line = 0.088813783 of an inch”, “An inch of rainfall = 100 tons per acre” and “The dip in horizon in nautical miles = 1.23 times the square root of the height”. It also lists the markings on a band lead line for sea soundings: did you know that the marks for 1, 2 and 3 fathoms are 1, 2 and 3 tags of leather and that for 10 fathoms it is leather with a bole in it? I can assume that the Paris line has something to do with microscopy, but the latter two leave me wondering. I could go on with equations for the velocity of falling bodies, arithmetical and geometrical progressions and the number of threads in Whitworth’s standard screws. I can only think that the author and publishers wanted to give the reader full value for their money. You may think, by these remarks of mine that I think little of this book, but this would be far from the truth. It is a mine of information for the microscopist interested in the use of the instrument in Victorian times. The first part of the book (about 350 pages) deals with the history, construction and optics of the microscope, whilst the second part (the remaining 650 pages) deals with the collection of specimens, their handling, viewing and structure. The book basically covers all that the amateur (and possibly even professional) Victorian microscopist could have wanted. To take one example, the text discusses the application of diffraction theory to the viewing of specimens such as diatom valves and the use of apertures “in excess of 180 degrees in air”. This forms part of a chapter entitled “The Principles and theory of vision with the compound microscope” and which runs to some 82 pages. This lengthy chapter concludes with “The optical investigation of Gauss” and the following piece of text will give an indication of the depths to which the book goes. To quote: Before leaving this section of our subject, in which we have endeavoured, with as much clearness as we could command, to enable the general reader to comprehend the principles of theoretical and applied optics as they relate to the microscope, we believe that we shall serve the higher interests of microscopy, and the wants or desires of the more advanced microscopical experts, if we endeavour to present in a form either devoid of technicality or with inevitable technicalities explained a general outline and then an application of the famous dioptric investigations of Gauss, an eminent German mathematician, who amongst many other brilliant labours in applied mathematics expounded the laws of the refraction of light in the case of a co-axial system of spherical surfaces, having media of various refractive indices lying between them. After a further tranche of text written in a similar manner, it continues We remember that the microscope ‘is largely used in England and America by men who can only employ it in more or less brief recessions from professional and commercial pursuits, but who often employ it with enthusiasm and intelligent purpose. Much scientific work may be done by rich men, and it will promote the accomplishment of this, in our judgement, if the frequently expressed desire be met which will enable such students to understand in a general way but thoroughly intelligent manner the principles involved in the employment of systems of lenses. I find this quite interesting from an historical point of view – it shows that the subject was, then, considered for the male, and that the female microscopist probably didn’t even exist. Thankfully things have now changed and we have many valued female members of the Quekett, including our current President. Apart from this I feel that the text quoted more or less describes a Quekett member, although I don’t think that many of us would now want to study the following ten pages of quite complicated formulae and ray tracing diagrams! This section of the book is followed by a discussion of the various types of microscopes available at the time and the well-known manufacturers (English, American, and Continental), with many good woodcut engravings of the various designs. One that I have never seen before is an instrument made by J. W. Stephenson made for examination of living objects in an aquarium. The description, which is quite detailed, is accompanied by an engraving of an aquarium complete with plants and fish. The author states that the design of the microscope allows any point of the aquarium to be reached. Apart from the different types of microscope, this section also covers, in great detail, the multitude of accessories then available, including such rarities as Dr. Pantocsek’s finder, Gillett’s condenser, and Stephenson’s catadioptric illuminator, to name but a few. 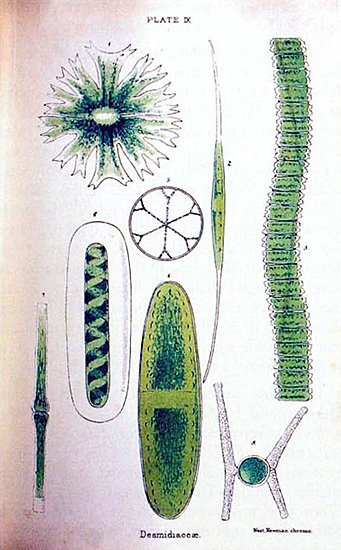 The final, and largest section of the book, describes the many types of specimen that can be studied under magnification from diatoms, rotifers, Polyzoa, crystals, muscles and much more. Many are illustrated by line drawings and some excellent coloured plates [Figs. 1, 2]. Having looked at this book again so that I could include it in this article, I have realised that there is much in it yet to study – I must get back to it very soon. Many Victorian slides were produced for the direct purpose of being viewed under polarized light, for their ‘artistic’, rather than scientific properties. My collection contains a number of these slides and they sparked off my “third interest” – polarization. With this interest awakened, I now have several polarising microscopes, including a Vickers of the M70 series, c.1960–1970, so when I found Hallimond , the book was another must have. Not only does it discuss the subject in a very thorough manner, it also describes in detail the use of the very instrument I have. Although I shall never have the expertise to use many of the techniques described, reading about them does help explain some of the effects that are visible when using the instruments, even at my ‘amateur’ level. From this amateur level the book can be quite daunting and I have to say that several of the subjects covered will never be clear to me – particularly when the text describes the various methods of crystal measurement, using fairly intense formul ae. The following chapter is titled “Theory of measurement of rotation and path difference (in transmitted and reflected light) – fundamental equations”. From this it can be seen that the book delves very deeply into the theory of the subject – including such topics as “measurement of an elliptically polarized beam” – not something I deal with every day! It may seem that I can’t find anything useful in this book, but that is not so. Many of the sections are very theoretical and beyond my level of expertise, but there are many other chapters that deal with the construction and use of the instrument on a much more ‘practical’ level. If one if prepared to search through the pages, much useful information can be found. For further reading there is a very extensive reference section at the end of the book running to nine pages, plus a series of excellent colour plates showing results such as the various interference figures and the differences obtained when using sensitive tint plates. Next on the list is Hartley’s excellent work , written by another member of the Quekett. This is another “Bible” – providing a very thorough discussion of the use of the microscope and how this has developed and changed over the years. Although the book covers the development of the instrument it is not, as mentioned by the author, a history of the instrument. He states that he is not an historian and writes in the foreword: This is not a history of the microscope, but might be described as its palaeontology, because the modern form and function have been determined by its heredity – and I think this sums up the ethos of the book quite accurately. The book is divided into 17 chapters, the early ones covering the origins and development of microscope design from Hooke through to Lister and on to the instrument post 1840. He then makes a lateral detour from the development to a section, which deals with the “human influences that shaped the evolution”. The chapter headed “Microscope Makers” covers the optical advances made over the period and the changes in manufacturing technique and the development of new materials. All had a profound effect on the general construction and use of the instrument. He points out that there is a vast difference between the craftsman constructing an early Pritchard microscope and the assembly line of the modern factory. He makes the very pertinent point that mass-production on an assembly line does not necessarily produce a better instrument than one hand made in a small workshop – in fact the reverse is often the case. The book is now fifteen years old and perhaps the advances made in CNC machinery and computer control might now have changed this viewpoint, but I wonder. Proceeding from this short detour, Hartley then discusses the later evolution of the microscope and here we are talking about late 19th century advancements, including such introductions as the Wenham binocular, the Abbe stereoscopic eyepiece and various methods of fine adjustment. These latter include the traditional English lever, Campbell differential screw and the Swift micrometer screw and tandem levers. Discussion also covers the Berger fine adjustment (used on the Zeiss Jug Handle design) and the Leitz fine adjustment with cardioid cam and worm gear. Looking at these designs (the book is very well illustrated with photographs and line drawings) and reading the descriptions makes me wonder why it was so necessary to have so many variations of a construction that achieved the same aim – fine focus of the objective. I can only assume that the various companies were very quick to patent their latest design, so that other manufacturers had to go down a different path. Looking at the constructional diagrams is quite amazing to see the intricate designs – and remember this was before the advent of computerised design and modern machinery. In this chapter there is also a comprehensive look at the various designs for the microscope body itself and the construction of coarse focussing racks (including the diagonally cut rack introduced by James Swift in 1881 – Powell & Lealand were slow to take up this design – one that was quickly accepted by virtually all other makers). It is interesting to note the author’s comment here, that it is perfectly possible to focus a 100:1 oil immersion objective using only the coarse adjustment of a good English microscope. I must admit that I haven’t tried it – too worried about damaging the slide or objective! This very interesting book then goes on to deal with the practical microscope, the binocular microscope and the optical action of the microscope. These chapters are followed by discussions on the objective and eyepiece (two separate chapters), transmitted, dark-ground and epi-illumination. Each chapter goes into its subject very thoroughly – for instance that on the objective covers such aspects as chromatic aberration, and the correction of the objective for spherical aberration by altering the primary image plane using the draw tube. There is also a section dealing with the use of correction collars – changing the separation of the objective lenses, to correct the same aberration. It would take a complete article (and a long one at that) to cover all the various facts and discussions in this book – not only does it cover the development of the instrument, the various designs available at different periods, but is gives a lot of information regarding the actual use of the instrument. It is a book that should be on the bookshelf of every serious microscopist. Turner’s catalogue of the RMS collection  was another must-have. Although it is a catalogue of the RMS collection, it is so well illustrated and carries such a wealth of information, that it becomes another extremely useful source of reference when studying nineteenth century instruments. In the foreword to the book the then President of the RMS, Dr Gillian Bullock, wrote: The Royal Microscopical Society was the first scientific society to be formed with a scientific instrument as its focus. In the 150 years since the Society was founded, the microscope has become a vital tool in medicine, public health and a wide range of scientific disciplines. It is therefore appropriate that the 150th anniversary of the Society should be marked by the publication of a detailed descriptive Catalogue of its remarkable collection of microscopes and accessories that has been amassed over so many formative years. Before looking at the collection, the author devotes the first chapter to the founding and history of the Society and the way in which the development of the instrument over his period affected the need for such an institution. The pages include a photograph of 50 Wellclose Square London E1, the birthplace of the Society on 3rd September 1839. It is very apposite to the Quekett that the house had been the home of Edwin J Quekett and that the Rev William Quekett lived next door at No 51. It is interesting to see that the Quekett family had links with microscopy even before the foundation of the Society. The book itself lists the various items in the collection virtually in chronological order, starting with Culpepper and Cuff designs and then proceeding through the various compound instruments up to the 20th century. The main English manufacturers such as Powell & Lealand, Ross, Smith & Beck, and Swift are given a chapter each and these are followed by a section on non-British compound ’scopes and some of the more esoteric designs – projection (Solar, Universal and Lucernal), plus simple instruments. The various accessories in the collection are divided into specimen preparation, specimen holders, illumination, polarization, objectives, drawing aids and miscellaneous. Following these there is a section on microruling, including instruments by Ibbetson, Farrants, Peters and Waterhouse. For anyone interested in the methods used to produce microwriting and rulings this section carries a great deal of useful information. Of particular note is a description of a Norbert resolution test-plate and a set of Grayson’s rulings (60,000 lines to the inch). As I have already mentioned this is purely a catalogue, but it is an extremely detailed one and the information listed for each item, together with the extensive photographs on virtually every page, make the book an invaluable source of reference for anyone trying to classify and date microscopes in their collection. It may not be possible to date a particular instrument exactly, but it can certainly help to place it within a decade or so of its manufacture. It is often possible to deduce which manufacturer produced it by studying the differences in style and construction between the various instruments. It certainly isn’t just a dull catalogue! Almost at the end of my list is Robinson & Bradbury , another ‘Bible’ when it comes to the theory and use of the polarising microscope. As I have already said, I am in no way an ‘expert’ in this field and should probably be classed as a dabbler, but ‘playing around’ with polarization is a very fascinating pastime. This book helps explain some of the phenomena that I am observing. As with the other books in this series, it opens with a section covering basic concepts – light waves, coherence and interference, before going on to talk about polarization in its various forms. As the authors explain in the introduction the primary object of the book is to explain how to use a polarized light microscope and the way in which it can be used to generate contrast in specimens. They point out that those who have never used such a microscope will be surprised at the great beauty of the colours, which can be produced by polarization. They also show that images obtained by polarized light can be changed by the use of retardation plates and that the aesthetic attraction of the colours and patterns produced rival those produced by the various forms of interference microscopy. I have to admit that this is one of the joys of using a petrological instrument that I really appreciate. Of course aesthetic results are not the real aim of using a polarizing microscope – there are far more ‘serious’ uses for such an instrument and the writers delve deeply into the various techniques that can be applied and the use to which they can be put. Having written about my twelve books, I noticed that Maurice ended up with thirteen in his list and I am hoping that the editor will allow me to go one better and list three more. I am not being cheeky because these last three I have added to the list are so small (all are foolscap 8vo and only about 70 pages long) that I think they can only really be counted as one. They are also extremely pertinent to an article such as this, as the author was a member of the Quekett. They were written by ‘A Quekett Club-man’ and published in 1887 and 1888. The first was on the practical use of the microscope  thus fitting in well with the remainder of my selection [Figs. 3, 4, 5]. It commences with a description of several of the instruments produced at that time, by such well-known makers such as Beck, Powell & Leyland, Ross and Crouch. It is very interesting to note (and rather deflating) that the then cost of a Powell & Lealand ‘No 2’ in its monocular form was £28, including two eyepieces, and the Ross ‘No 1’ in Binocular form fetched the princely sum of £33 and 5 shillings. Oh that we could still buy this type of instrument for similar amounts – even allowing for inflation! The author then continues with a description of the various accessories that were obtainable for the differing types of microscope, all couched in a very down-to-earth and easy to understand manner. Following these descriptions of the accessories, there is a section offering “practical hints to the student”, including the phrase When examining test objects by lamplight, always turn the flame of your lamp thin edge towards the mirror. Working with artificial illumination must have taken quite a great deal of practice to obtain good results. The book concludes with a List of Books that may advantageously consulted, and a selected list of London Opticians, from whom reliable microscopes may be obtained. It is interesting to see that only London firms are shown; was this because the Quekett was then basically only a London club? One of the Opticians listed is C. Coppock, New Bond Street; he isn’t listed in Brian Bracegirdle’s book, although the other twelve are; has anyone heard of this firm – he is shown in the text as a “producer” rather than just a supplier? The next is actually about using the telescope , so I suppose I am really stretching the tolerance of the editor by including it [Figs. 6, 7, 8], but it is by the same Quekett Club-man and was produced in exactly the same format as the other two and forms part of the set. I came across it after having acquired the two microscope-related titles and just had to add it to my collection. Not only do I have an interest in telescopes (yes I have a number of those as well, although not Victorian this time) but it also completed the ‘set’. 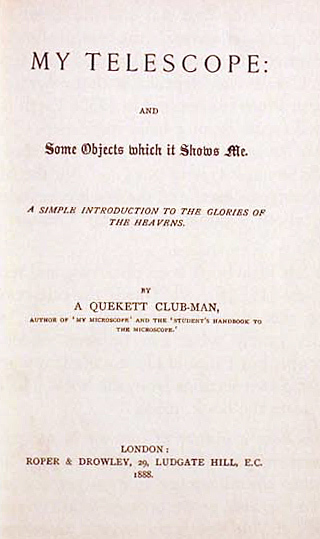 The title page states “My Telescope: and some objects which it shows me. A simple introduction to the glories of the heavens. By a Quekett Club-man”. There is, I suppose, a vague link to the microscope as the frontispiece illustration is of a four inch refracting telescope by “Mr Browning” the well know manufacturer of microspectroscopes in the late 1800s. 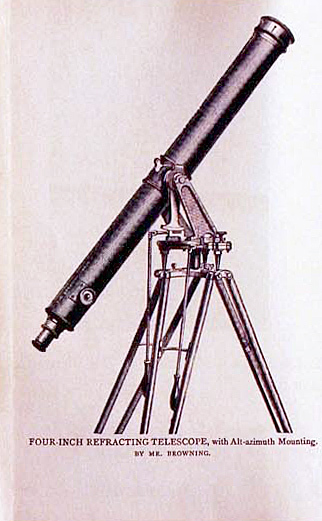 The author starts by describing the basic design of the two main forms of telescope, the refractor and the reflector and finishes the first chapter by explaining that: the refractor is easy to use and is most suitable for observers with modest aspirations as to optical means, or either well-lined purses if they are more ambitious and wish to work with large apertures. The expense of working with achromats of large diameter is so great that the cost of even a six-inch object glass of the highest quality puts it out of the reach of all but wealthy persons. Since the introduction and perfection of reflectors, a very large amount of optical power has been placed within the reach of that large class of observers who have not too much of this world’s goods, but who yet are desirous of doing good amateur astronomical work. So cost considerations were well to the fore from even 120 years ago – things haven’t changed much since then. The remaining chapters cover the “Index to the Heavens” (the Pole star and the Great Bear), “The Ruler of our system” (the Sun), followed by “The Planets” Mercury and Venus, Mars, Jupiter, Saturn, Uranus and Neptune, with no mention, of course, of Pluto (discovered in 1930). Earth is not discussed (apart from a brief mention) – “if we may take the earth as a type of planet, we may also treat the Sun as a type of star…” but the Moon has a chapter to itself and the book concludes by talking about Double Stars, Star Clusters and Nebulae. It has been a matter of surprise to me when I have been enjoying the pleasure of showing ‘something under the microscope’ to a sympathetic public at a conversazione, or similar well-meant recreative assembly, to find how very large a proportion of them have never looked down a microscope worthy of the name, and to learn how very faint and feeble an idea they have of what they should see. Under these circumstances it was also impossible to expect them to have any knowledge of the construction of the instrument, and the aim and uses of its various parts. In the following pages I propose, therefore, to take the reader with me, under the supposition that he is under much the same cloud of innocence on the subject, and to show him one of my microscopes, and a few objects from my cabinet. I suppose that things haven’t changed much in 120 years – the general public still has little idea of what the microscope can do! 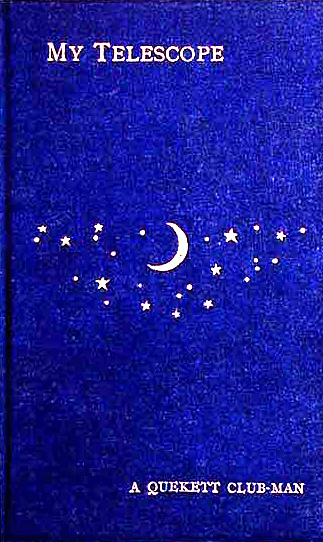 The other piece of text completes the main text of the book – having discussed microphotographs, the author concludes: These are no doubt, very admirable specimens of human dexterity and ingenuity; but if we are willing to have any possible conceit which their inspection may have engendered completely eradicated, we shall do well to compare, of course under the same power of the microscope in each case, the finest cambric needle we can procure, and the sting of a wasp or bee; also a piece of the most expensive French cambric itself, and the areolations (ocelli) of the compound eye of a beetle. Such contrast will teach us, if aught can, that our powers, by the side of nature’s effortless productions, are merely insignificant, and that wonderful minutiae and perfection of natural objects provides us with an every-opening vista of enjoyment and admiration. 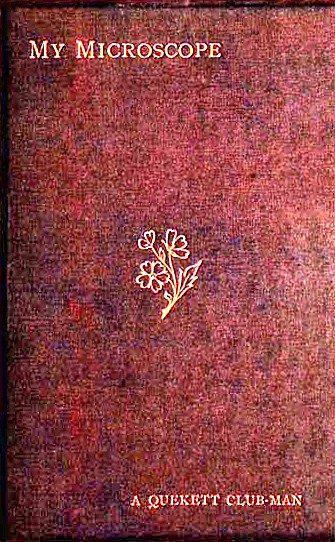 Then as an end-piece, he concludes: In selecting our chats, and taking leave, I would remark that we have but chosen a blossom here and there from the hedge which glitters in the sunlight with myriad flowers – that we have only seen a stray specimen or two of the marvels of many an obscure world; even as the dainty glasses in a lady’s chamber exhibit but faint evidence of the glories of the conservatory, so it has been with us. Should you, having followed the path thus far, wish to enter more thoroughly into the mysteries of the minute, a happy time awaits you; nature has hidden at every turn, and each plant, stone and insect will transform itself into a friend. Although these passages are couched in the rather laborious way that the Victorians used when writing, they do, I think, sum up what microscopy is all about and is the basis for the very existence of ‘The Quekett’. As such, they form an excellent ending to this ‘list’ of favourite books. 1. Barron, A L E – Using the Microscope. London: Chapman & Hall, 1965. 2. Olliver, C W – The Intelligent use of the Microscope. London: Chapman & Hall, 1947, 2ed 1951. 3. Beck, R – The Achromatic Microscope. London: van Voorst, 1865. (Reprinted Chicago: Science Heritage, 1987). 4. Bradbury, S & Bracegirdle, B (1998) – Introduction to Light Microscopy. Oxford: BIOS, 1998. 5. Bradbury, S & Evennett, P J – Contrast Techniques in Light Microscopy. Oxford: BIOS, 1996. 6. Bracegirdle, B – Microscopical Mounts and Mounters. London: Quekett Microscopical Club, 1998. 7. Bracegirdle, B – Notes on Modern Microscope Manufacturers. London: Quekett Microscopical Club, 1996. 8. Carpenter, W B – The Microscope and its Revelations. London: Churchill, London, 7ed 1891. 9. Hallimond, A F – The Polarising Microscope. York: Cooke, Troughton & Simms [Vickers], 1948, 2ed 1953, 3ed 1970. 10. Hartley, W G – The Light Microscope – its use and development. Witney: Senecio, 1993. 11. Turner, G L’ E – The Great Age of the Microscope, the collection of the Royal Microscopical Society through 150 years. Bristol: Hilger, 1989. 12. Bradbury, S & Robinson, P C – Qualitative Polarized Light Microscopy. Oxford: University Press, 1992. 13. 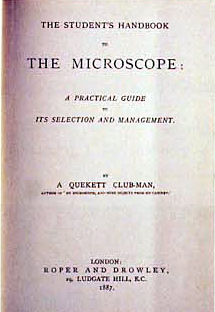 A Quekett Club-man – The Student’s Handbook to The Microscope – A practical guide to its selection and management. London: Roper & Drowley, 1887. 14. A Quekett Club-man – My Telescope: and some objects which it shows me London: Roper & Drowley, 1888. 15. A Quekett Club-man – My Microscope and some objects from my Cabinet. A simple introduction to the study of the ‘Infinitely Little’. London: Roper & Drowley, 1887.